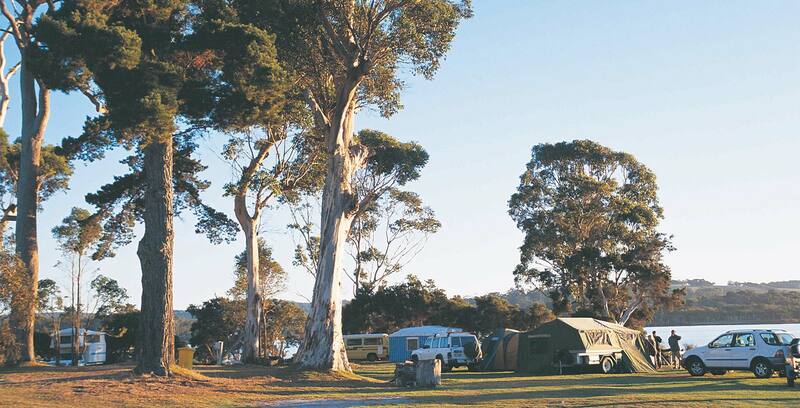 Whether you are travelling with your own caravan, tent or camper trailer or prefer an on site caravan or chalet, Walpole has plenty of sites and parks to choose from. From the "Grey Nomads" to young couples, families or groups, this type of accommodation is a great way to enjoy wide open spaces, natural surroundings and a star filled sky at night. Coalmine Beach Holiday Park is located 2 kms East of Walpole. Take the Coalmine Beach road/Knoll Drive turnoff, off the South Coast Highway and follow the Drive to the Coalmine Beach Holiday Park Entrance. The office is located 100 metres on the left hand side of driveway and has an after hours number at the door if the office is unattended. Please call us in advance if you are going to be a late arrival. From Pemberton travel south towards Northcliffe or Nannup, turn onto Old Vasse Rd, turn into the Heartbreak Trail Scenic Drive, follow drive past Maidenbush, Drafty's Campsite entrance is the next on the right. Road is not suitable for large vehicles or any towed caravans. From Pemberton travel south towards Northcliffe or Nannup, turn on to Old Vasse Rd. Turn into the entrance to the Heartbreak Trail Scenic Drive, continue past Maidenbush & Drafty's Campsite, entrance to Warren Campsite is on the right. Travel from Northcliffe 1.5km toward Windy Harbour down Wheatley Coast Rd, turn left onto Boorara Rd, follow until Riverway Rd on the right. Follow Riverway Rd across the Loverock Rd crossroad, Sid's Campground is the first property on the left, look for the signage. From Northcliffe travel south towards Windy Harbour on Windy Harbour Rd, turn right onto Summertime Track. Drop tyre pressure and continue along track to Malimup Beach.